If you require a pack for more students or would like to create your own Drum Pack with different instruments please give us a call on 01622 522110 and we will be happy to help. 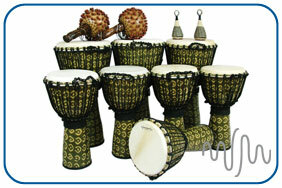 Our Large Drum Pack contains everything that you need to create a complete African percussion section. 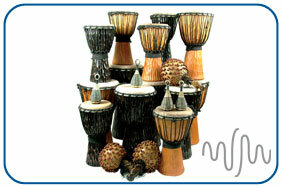 A full range of Dundun drums provide the bass, a wide selection of Djembe sizes make up the ensemble rhythms and the section is completed with the traditional African hand percussion instruments , Caxixi and Shekeres. circle, music class or club. Our Medium Drum Pack provides an excellent insight into the range of drums played along the west coast of Africa. 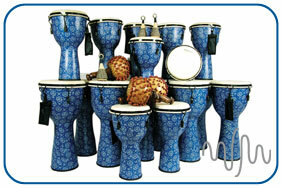 The range of Djembe sizes create multilayered rhythms led by a drum leader on the larger sized Djembe. The Kenkeni drum adds another dimension of deep bass sound and the Caxixi and Gourd Shekeres provide the treble, completing the percussion section. 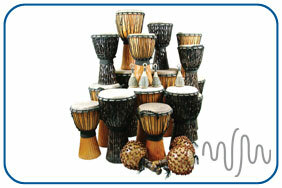 Our large Djembe pack is perfect for adding a large number of different sized Djembe to your drum circle or classroom. We have selected Djembe from our Jammer Series to provide a wide range of tones, allowing multilayered, complex rhythms to be created. To complete the percussion section we have included the traditional African percussion instruments Caxixi and Gourd Shekeres. instruments Caxixi and Gourd Shekere. perfect for your group of class. Our Small Djembe Pack is perfect for any small group or individual performer looking to add high quality African percussion to their collection. Representing great value for money, this pack includes 5 of our larger Jammer Djembe drums, handpicked for the best sound quality and range. A Gourd Shekere and 2 Caxixi complete the pack and add African percussion instruments that traditionally accompany the Djembe drum. 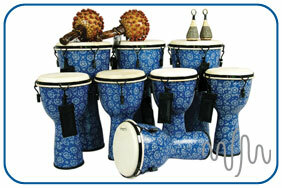 quality African percussion into their repertoire. Our Large Mechanically Tuned Djembe Pack is the best choice if you are looking for an entire classroom full of lightweight, robust Djembe drums with a great range of powerful tones. Natural Goat skins with a modern mechanical tuning system give an authentic rich tone that resonates deep bass but also has sharp, responsive slap tones. The fibreglass body is light yet robust making a shell perfectly suited for the classroom or more mobile drum facilitators. 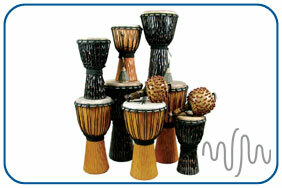 Our Medium Mechanically Tuned Djembe Pack offers an excellent opportunity for any drum facilitators who wish to add great sounding, robust Djembes to their drum circle. 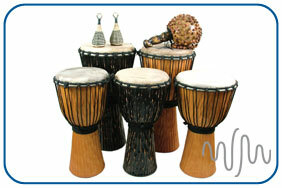 Our Large Rope Tuned Fibreglass Djembe Pack combines the best of modern materials and ancient techniques to bring you an entire classroom full of great sounding Djembe drums. Natural Goat skins and traditional rope-strung heads keep an authentic rich tone that resonates deep bass but also has sharp, responsive slap tones. 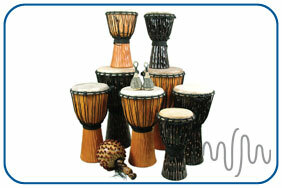 Our Medium Rope Tuned Fibreglass Djembe Pack provides an ideal way of equipping a medium sized drum circle or for adding great sounding Djembes to an existing class. African drumming has becme one of the most popular ethnic percussion pastimes with drumming workshops available in every local area. 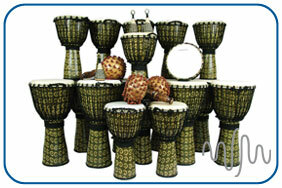 Tap in to this growing market with our fantastic Economy Djembe Pack. Offering a great range of drums from low cost through to higher value products you will be able to fulfill your customers needs. With a resale value of at least £260 this Djembe Pack offers excellent value and an impressive product range that customers will want to buy. The perfect way to purchase didgeridoos for resale. All of our didgeridoos are handcrafted in South-East Asia to a high standard. Easy to play these instruments are perfect for beginners and seasones players alike. Ten Didgeridoo packages along with a display rack and additional CD and DVD will provide all that you need to start selling this popular instrument. With a resale value of at least £280 this pack provides fantastic value and a real focal point with your customers. 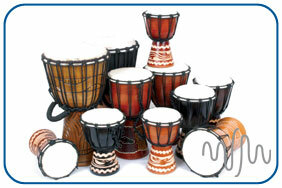 A wide selection of hand percussion instruments taken from our extensive range. This is the perfect way to purchase a cross section of our hottest selling items at a fantastic price. This eclectic assortment has something for everyone. With no experience needed to play the instruments, the products in this pack have universal appeal. With a resale value of over £240 this pack provides amazing value and a substantial range of products to offer your customers. The perfect way to add our hottest selling items to your product range. A huge pack of instruments including hand percussion, woodwind, djembes, didgeridoos and rainsticks. Ideal for diversifying your current product range this variety of high quality instruments will add fantastic value to your current product offering.